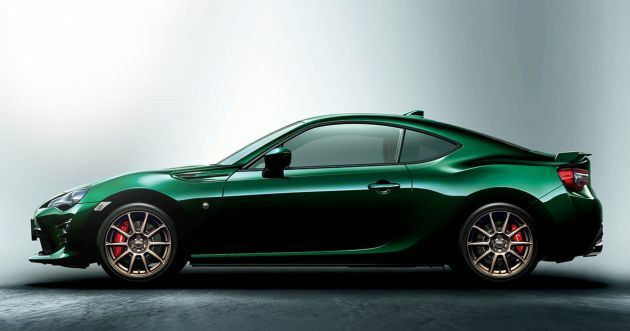 If you’re a fan of British Racing Green, Toyota has a treat for you because it recently launched the 86 British Green Limited. Lovely, isn’t it? Unfortunately, the limited edition model is only available for purchase in Japan, where it is priced from 3,251,880 yen (RM119,476). The eye-pleasing paintjob is only part of the story here, as Toyota has also fitted the 86 with new cast aluminium wheels finished in bronze. These wheels not only pair well with the applied hue, but also serve to accommodate the Brembo brakes that feature four-pot front and two-pot rear calipers. The optional Sachs dampers come as standard on this model, while other add-ons on the exterior include aero underbody covers and a black boot-mounted spoiler with green winglets. Inside, the dark tan and black seats are made with a combination of Alcantara and leather. There’s also contrast stitching in tan or black on various parts of the cabin, including the steering wheel, shift boot, parking brake, door trim and knee pad. Toyota also added black trim to the centre console and deleted the main infotainment system, leaving just a cover in its place. As before, the power output from the 2.0 litre naturally-aspirated flat-four engine remains the same at 207 PS with the six-speed manual, while the optional six-speed auto gets just 200 PS to play with. Wow! Still dreaming, just like he dreamed the new government is doing well. Before your company planning to stop production of this 86 and Copen. Kindly pass down your blueprint to Perodua. P2 will make sure interior and exterior design is well done. At least Malaysian could have sport 2 door car. Price it well and Malaysia will export to Asian country. Double winning for Toyota and Perodua while Daihatsu and Perodua. We appreciate your kind consideration. Even in Indo market, Copen only lasted 4 years on sale. Not even able to stretch it for a model change. No point coming to Malaysia, whatmore Perodua only focus on profitable models, not low volume sellers like this 2 door car. Toyota copied lotus colour of green, uses BMW engine, rebadges mazda2 and what’s next? Copies X70 infinite weave grill? They make money by endangering their car owners lives with low-specced cars is not something to be proud, instead they should be ashamed. Apa kita dapat? Habuk pun tada!